Matt Owens graduated with his Masters in Social Work from the University of South Carolina in 2018. As part of his educational experience, he partnered with Beginnings SC as a student-consult, helping to address a critical need in reaching our Spanish-speaking families. Growing up as a sibling to a Deaf sister, Matt understands the important role that family members play in the development of their child with hearing loss. 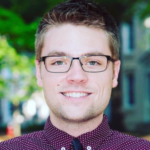 He joined the Beginnings SC team in August 2018 to connect his passion for political action, as well as his knowledge and expertise, to create more positive outcomes for those with hearing loss in South Carolina. Matt has been playing volleyball competitively since age 12, and enjoys running, biking, cooking, and attending community events in his free time.